I am writing a book—Solving the Moment: A Collaborative Couple Therapy Manual—which is based on my blog entries. 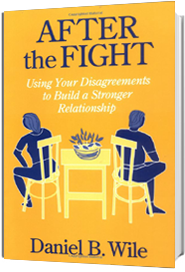 Among the special methods I discuss in this book is the sentence-completion question. 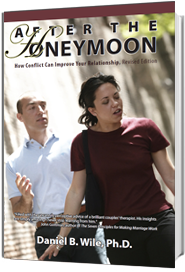 One way to join with partners in Collaborative Couple Therapy is to double for them. Another is to add a few words to what they say. Jack (to Lois): You’ve stopped doing the sweet things you used to do. I could also have said “for example____” or “an example of which is___.” There’s a fluidity and concision in adding to a partner’s sentence. As people generally do, Jack treats my addition as something he had said. He repeats my words and goes on to finish the sentence. Jack: Such as giving me spontaneous hugs and texting me at work. Dan (doubling for Jack): And that leaves me worrying that____. Jack: That Lois doesn’t care about me anymore. If it feels comfortable to speak as the person (“And that leaves me___”), I do so. If it feels intrusive or awkward, I speak instead to the person (“And that leaves you____”). In either case, a rhythm gets started. I try to give partners something to glide into. Partners who respond hesitantly when asked “Can you say more about it?” or “What’s an example?” respond more fluidly to “in that___” or “such as___.” By continuing their sentence, I’m joining them in what they are doing rather than approaching from the outside asking questions. They feel less interrogated. At times I put words to what a partner implies. Miriam: Clara says that she wants a separation. She’s probably right. We’re not getting along. It’s been a long struggle. I don’t know (trails off). Miriam’s nonverbal behavior suggests that she has reservations about Clara’s idea of separating. I bring these reservations into the open. Miriam: That doesn’t feel right. Later in the session, I press for deeper feelings, using a form of sentence-completion question I picked up from a colleague, Donna Scott, and from watching a Harville Hendrix videotape. Miriam (to Clara): The family, you, everything. Other phrases that pull for deeper emotions are “And my greatest fear is____,” “And what upsets me in particular (haunts me the most) about that is____,” “And my greatest hope (or what I most long for) is____,” It is breathtaking how quickly an intervention of this sort can shift partners out of an adversarial or distant stance and into intimate talking, commiserating, and coming to grips with what’s at stake. At times I start a fresh new sentence. Laticia (to Rodrigo): Why do you always have to explode like that? Rodrigo: Oh, so you’re completely innocent, huh? Laticia: Wait a minute! I’m not the one who got so angry. Rodrigo: What do you mean? I could tell you were upset with me the minute I walked in the door. I’m taking Rodrigo back to the moment before the fight in search of the soft-underbelly feeling that might lie under his anger. Rodrigo (softly): That I’d done something wrong. You know me. That’s where I go. I felt that I’d done something wrong. It is possible at this point to do what I saw Harville Hendrix do on the videotape and try to track Rodrigo’s reaction to childhood. Rodrigo: And that reminds me of—. I don’t know. Dan (persisting): “And that reminds me of how in childhood____. In summary, I use the sentence-completion question to (1) provide a fluid way to encourage elaboration by asking partners to give examples, express feelings, or draw conclusions about what they just said and (2) deepen the conversation by putting words to what’s just been implied, adding a phrase that probes for emotion (“What frightens me the most about that is___”) or starting a new sentence that pulls for soft underbelly feelings. Jack (to Lois): You’ve stopped doing the sweet things you used to do like making special meals and calling me at work. Lois (breaking in): Just look at my schedule, would you! I get up early—it’s still dark for heaven’s sake—then I struggle through traffic, work this high-pressure job, and struggle back through traffic. When am I going to find time to make special meals or call you at work or anything else? Jack: Yeah, I know. It’s just that I (stops). Dan (doubling for Jack): It’s just that I____? Jack: I don’t know. I can’t put it in words (fades out). Jack: How your face would light up when I entered the room. Lois: My face would light up? Jack: In the most wonderful way. In fact, in the way it’s doing right now. Lois: I know. Come over here. 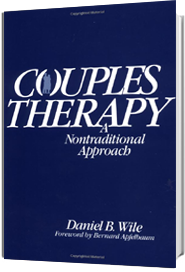 Thank you Dan: I will put the sentence completion right to work with my couples…it seems to flow so much better! Thank you for your newsletter. I love the language of this blog: “join with partners,” “fluidity and concision,” “add to jack’s sentence,” “rhythm,” “glide into,” “respond fluidly,” and most of all: “I’m joining them in what they are doing rather than approaching from the outside, asking questions.” These, combined with occasionally moving your chair next to partners enables, I believe, the therapist to enfold him or herself into the couple’s experience, thereby increasing “ownership,” and generalization to a home environment. What I like about this approach is that it almost takes you out of the conversation as a third person as you become part of their own reflections, thoughts and productions. It seems less intrusive, more intimate. Thanks for this great blog on Sentence Completion. I also enjoyed the comments. I learned sentence completion as part of doubling, created by JL Moreno the founder of Psychodrama. I believe he brought the technique to the world of therapy as far back as the 1920’s. In his theory, doubling is what the mother does when the child is born. It is the symbiotic stage of development where there is no separation between the child and parent. The child feels totally connected, rather than separate and the mother knows every need of the child. They are one. When we double our clients, speaking as them using an “I” statement, rather than “you,” we are, as Dan and others write, joining with them, thus contributing to healing that stage in their life in which they did not receive enough doubling. Moreno taught that until we have had enough doubling, we cannot truly role reverse–see the world through the eyes of another. When we double in psychodrama, we “empty ourselves out” of our own agenda and take the body position of the client so we can somatically tune into them and experience what they are experiencing in the present moment. The client is told that if the double is correct, to repeat what was said, using the same words or other words, or just change it if it is not correct. Sentence completion is one way of doubling. And I know Dan also uses other forms of doubling as well. I enjoy using doubling. I feel more engaged than sitting across the room. Not many therapist talk write about it. And certainly not the sentence completion. So thank you for doing so. And for hte examples you give. It is inspiring to read your entry. Dan, love this article. I especially love how you put what might remain “elusively intuitive” to words so that it is practical and easy to share with others. I just used this concept with a clinician in supervision as an approach to keep the individual client from feeling interrupted and lose the flow of dialogue. How even more powerful this would be in a couple enactment. Thanks. NOTE: I have been following you, but recently moved to Japan so haven’t commented in a while.